Mechanisms controlling the successful invasion of resource demanding species into low-resource environments are still poorly understood. Well-adapted native species are often considered superior competitors under stressful conditions. Here we investigate the competitive ability of the resource demanding alien Acacia longifolia, which invades nutrient-poor Mediterranean sand dunes such as in coastal areas of Portugal. We explore the hypothesis that drought may limit invasion in a factorial competition experiment of the alien invasive versus two native species of different functional groups (Halimium halimifolium, Pinus pinea), under well-watered and drought conditions. Changes in biomass, allocation pattern, and N-uptake-efficiency (via 15N-labeling) indicated a marked drought sensitivity of the invader. However, highly efficient drought adaptations of the native species did not provide a competitive advantage under water limiting conditions. The competitive strength of H. halimifolium towards the alien invader under well-watered conditions turned into a positive interaction between both species under drought. Further, low resource utilization by native species benefited A. longifolia by permitting continued high nitrogen uptake under drought. Hence, the N-fixing invader expresses low plasticity by continuous high resource utilization, even under low resource conditions. 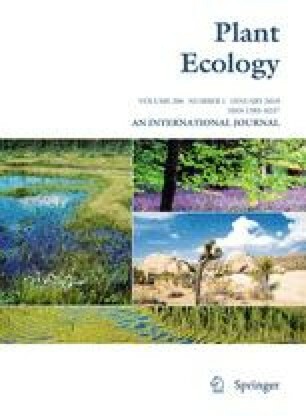 The introduction of novel traits into a community like N-fixation and high resource use may promote A. longifolia invasiveness through changes in the physical environment, i.e., the water and nutrient cycle of the invaded sand dune system, thereby potentially disrupting the co-evolved interactions within the native plant community. This work has been funded by the Deutsche Forschungsgemeinschaft (Transdune, WE 2681/3-1) and the FCT (POCTI/BSE/34689/2000). We acknowledge valuable comments from K. Rascher and significant technical support during the experiment and isotope analysis from E. Furlkröger and B. Teichner, respectively.